When they say tennis is a lifetime sport, they mean it. I spent time last week watching a pair of geezers prove it. 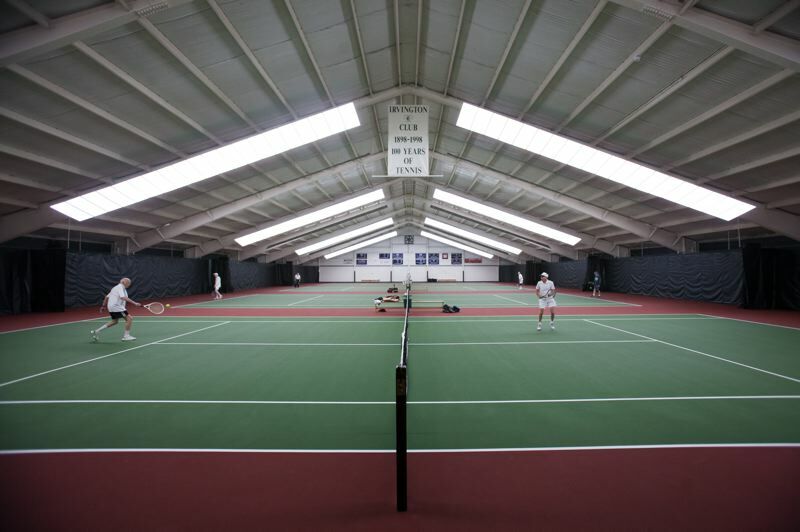 The Irvington Club — founded in 1898, the shrine of tennis in the city — played host to the Oregon State Senior Men's Indoor Championships, with draws for players 45-and-up to the 85s. Through a match that lasted two hours and 10 minutes, I watched as Ron Reynoldson of Hillsboro and Steve Hall of Charbonneau slugged it out in the first round of 80s singles, with Reynoldson prevailing 3-6, 6-3, 6-4. Six players were in the 80s singles draw, two teams were in the 80s doubles draw and three players were in the 85s singles, matching talents and wits in a round-robin format. It was wonderful to watch these aging, and in some ways ageless, warriors going at it. 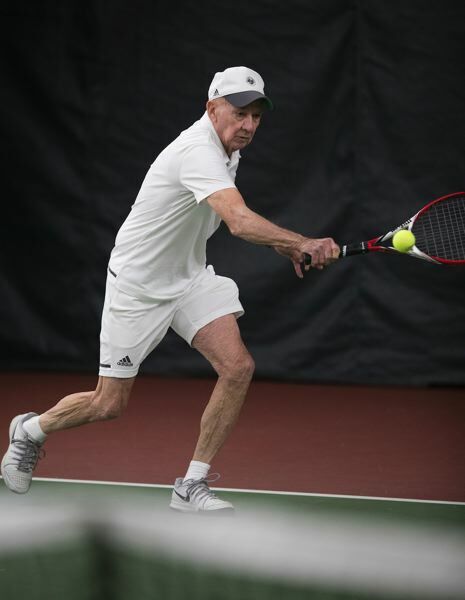 At a stage in life when many octogenarians are struggling to stay vertical, Reynoldson and Hall went at it for more than two hours on the tennis court, and lived to tell about it. Reynoldson, 82, grew up as the sixth of 10 children in an Iowa household. Baseball was his sport as a youngster. He took up tennis in his mid-30s and raised one son, David, who was good enough to play tennis at Cal Poly. In 2017, Reynoldson suffered a stroke that caused him to have memory issues. Six months later, he was back on the tennis court. One of his sources of motivation was a desire to play as an 80-year-old in father-son events with his son, now 54. 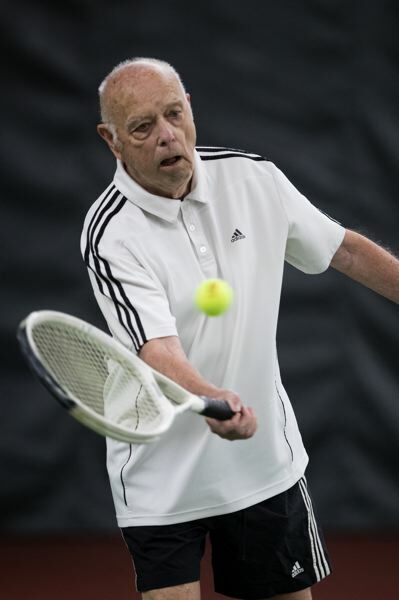 "Playing tennis has certainly helped me regain my memory loss, as well as keep my fitness up," says the 5-8, 140-pound Reynoldson, a retired probation officer. Reynoldson was on his heels in the first set against Hall, whose craftiness made up for Reynoldson's advantage in ability to cover the court. Reynoldson, who moves like a man two decades younger, had the better of it in the final two sets, though he wasn't happy with the way he played. "I'm still a little rusty," he says. "It showed in my match. Steve is a good player. He moved me around. He made me run a lot more than I made him run." Hall, soon to turn 82, is a study in energy conservation on the court, walking slowly back to position after each point but hustling ably while the ball was in play. He employs a short toss and sidearm serve, but he makes it work — zero double faults during his match with Reynoldson. "Senior players rarely double-fault," says Hall, who chips, lobs and uses angles like the expert he is, knocking the ball where he wants with precision wrist shots. "When you get older, you can't hit the ball hard. You resort to what works. " A Roseburg native, Hall grew up two blocks from the high school tennis courts and began playing in seventh grade. He played on an Al Hoffman-coached Indians team that won 54 straight matches, and he played varsity tennis at Oregon State. Hall then launched into a 30-year career working with Pacific Power & Light. Since retiring in 2008, Hall has worked part time as manager of the Charbonneau Tennis Club. He also is a lifetime honorary member at Irvington Club and has served as the chair of the USTA/PNW historical committee since 2000. Hall — who plays in the Rod Laver Adidas throwback shoes that have been part of his repertoire for the past 30 years — and Reynoldson have done battle many times on the tennis courts. "This is the first time I've ever taken a set off of him," Hall says. "Ron is one of the really good players. He has good strokes. I knew it was a long shot, that it would be a real upset to beat him. I just wanted to be respectable. I felt I played reasonably well." Hall has had his own health issues. He had his gallbladder removed last summer. He says he has been fighting pneumonia for a year and a half. He still has found time to run 2 1/2 miles on a track a couple of times a week. "But my times have dropped off," he says. "My endurance has suffered." It didn't seem that way in his match with Reynoldson. If exhaustion had set in with either player after their marathon match, they could have fooled anybody. Both were preparing to play a doubles match the following day, in which Hall would team with Larry Nielson to beat Reynoldson and Gary Woodring 6-0, 6-3. "I've played more in doubles than singles recently," Reynoldson says. "I don't cover the court as well. I enjoy singles more, but I love to play doubles, too." "Fitness is really important to good health," Hall says. "Tennis is a lot more fun than running on the treadmill. It's something I've done all my life. I've really enjoyed it and met some great people." Hall has no plans to quit playing tennis. "I'm going to play as long as I can," he says. "I might play another 10 years. We had a couple guys at Charbonneau playing into their late 80s. I'll probably be able to do that. "But you reach a point with competitive tennis when you just don't feel you're doing well and you drop out. When I reach a point where I'm getting blitzed, I'll fold up the competitive stuff." Neither Reynoldson nor Hall are nearing that point yet. The legs don't move like they once did, but they play what I call "brain tennis" — using the noggin, the experience and the expertise to stay a step ahead of the guy on the other side of the net. There was little bellyaching about unforced errors during their match. No disputes about line calls. Just respect for each other, and for the game itself. It was a beautiful match to watch. Indeed, tennis really can be a lifetime sport.